Tammie Wilson, chief nursing officer at Fayette County Memorial Hospital, signs a rose that will be placed on the 2019 Donate Life Rose Parade Float at this year’s Rose Parade on Jan. 1, 2019. This is to show appreciation for the continued support Fayette County Memorial Hospital shows Lifeline of Ohio through the organ, eye and tissue donation process. Fayette County Memorial Hospital and Lifeline of Ohio will be honored at the Tournament of Roses Parade on Jan. 1, 2019. Lifeline of Ohio is an independent, non-profit organization that promotes and coordinates the donation of human organs and tissue for transplantation. Lifeline of Ohio serves 72 hospitals in 37 counties in Ohio and two in West Virginia, and is designated as an organ procurement organization through the Centers for Medicare and Medicaid Services. For years Lifeline has been the organ and tissue partner with FCMH. 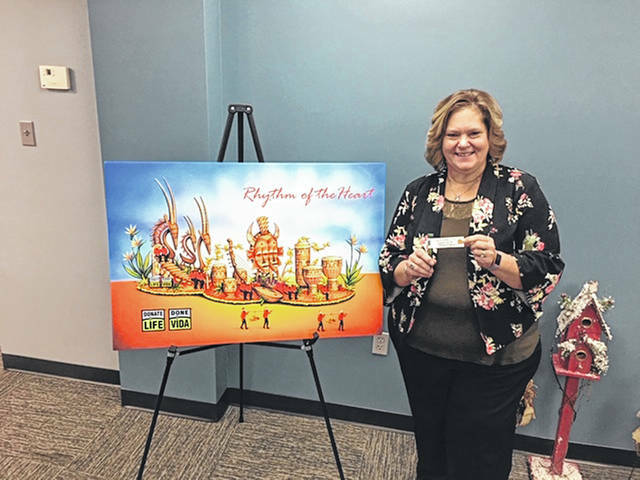 To show appreciation for the continued support Fayette County Memorial Hospital shows Lifeline of Ohio through the organ, eye and tissue donation process, Lifeline of Ohio will be placing a rose on the 2019 Donate Life Rose Parade Float signed by Tammie Wilson, chief nursing officer at FCMH. According to tournamentofroses.com, since 1890 the Tournament of Roses has produced America’s New Year Celebration, bringing the traditions of the Rose Parade and Rose Bowl Game to Pasadena and the world for nearly 130 years. As the “world’s most visible campaign to inspire organ, eye and tissue donation,” — according to a press release — the 2019 Donate Life Rose Parade float, “Rhythm of the Heart,” highlights the musical diversity and rhythms of Africa. Djembe drums from Senegal, along with a Kuba drum from the Congo will carefully integrate 44 floral portraits in their beautiful design, honoring the brave lives of deceased donors. Twenty-six living donors or transplant recipients ride or walk beside the float, gathering around the drums, a giant marimba from Ghana, and an exotic kora from Burkina Faso. The Donate Life Rose Parade float is celebrating its 16th year in the Rose Parade. The information in this article was provided by Whitney Gentry, FCMH Foundation Director, and Lifeline of Ohio. https://www.recordherald.com/wp-content/uploads/sites/27/2018/11/web1_IMG_0147.jpgTammie Wilson, chief nursing officer at Fayette County Memorial Hospital, signs a rose that will be placed on the 2019 Donate Life Rose Parade Float at this year’s Rose Parade on Jan. 1, 2019. This is to show appreciation for the continued support Fayette County Memorial Hospital shows Lifeline of Ohio through the organ, eye and tissue donation process.